Weight reduction is an important factor in improving fuel economy and controlling CO2 emissions of transportation equipment such as aircraft and automobiles. To that end, it is compelling to develop light and strong materials. As a solution to this problem, the development of alloys based on magnesium (Mg), which is the lightest substance element for structural metals, has attracted attention in recent years. b) This element is abundant as a resource and exists especially near the surface of the earth. It is the eighth most commonly found of all the elements occupying the periodic table, and the fourth most common among practical metals. c) Magnesium contains in the human body, and it has a high level of biocompatibility. So, it can potentially be used in medical materials such as stents. d) Since it’s melting point is relatively low at 650℃, it is easy to melt and to recycle. e) As lightweight as it is, “beams” can be made thicker, to have higher flexural rigidity compared with iron and Al. Mg alloys have been deemed disadvantageous because they have lower mechanical strength at room temperature than many aerospace grade Al alloys commonly used in aircraft, such as duralumin. Even though it is light, practical application is difficult if the material is weak. Low resistance to corrosion (it tends to rust easily) and low ignition temperature have also been major issues. Yoshihito Kawamura, Director of the Center, appointed to the Faculty of Engineering at Kumamoto University in 2000, who was working on material development to overcome the general problems related to Mg alloys as described above, discovered that alloys containing 1 at% zinc (Zn) and 2 at% yttrium (Y) in Mg showed unprecedented high strength properties. The crystal structure of Mg is a hexagonal closed packed structure (hcp) (see Figure 1). In this structure, Mg atoms are aligned without any gaps. Atoms are then stacked on top of that in the same way, without any gaps. At that time, the atoms of the upper layers are stacked so as to get in-between the atoms of the lower layers. If the bottom layer is layer A, the layer above it (layer B) will be a layer that deviates from the position of layer A. The next layer is formed in the same arrangement as layer A (see Figure 2 (a)). A material having an hcp structure regularly accumulates atomic layers in a two-layer cycle in this way (therefore, hcp structure is also called 2H structure). However, in the magnesium alloy (Mg-Zn-Y) originally developed at Kumamoto University, it has become clear that there are layers in which Zn and Y are formed between Mg stack structures with an hcp structure. If only Mg were used, it would be aligned as ABAB… But a new layer (layer C) is included in the layer with Zn and Y atoms (see Figure 2 (b)). Moreover, given that layer C does not enter randomly, it has a specific stacking cycle and its cycle is relatively long. Therefore, we call such a crystal structure a Long Period Stacking Ordered Structure (LPSO Structure). 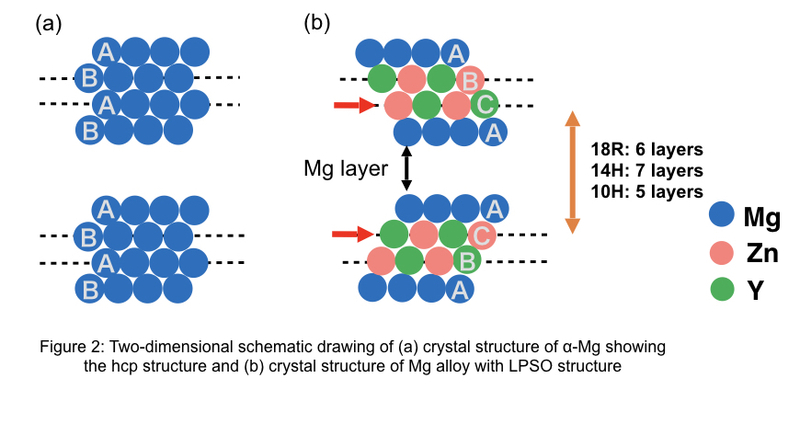 It is highly likely that this LPSO structure is the main reason for the ultrahigh-strength of the Mg-Zn-Y alloy, MRC has been working on elucidating the formation mechanism and the mechanical properties of the magnesium alloy having the LPSO structure. As a result of analyzing this unique structure using high-precision HAADF-STEM Transmission Electron Microscopy (TEM), it was discovered that polytypic structures with different numbers of Mg layers (10H, 18R, 14H, 24R, etc.) exist. It was also discovered that the LPSO structure appears even when Zn is replaced by a metal element having similar properties, such as Co, Ni or Cu, or when Y is changed to Gd, Tb, Dy, Ho, Er, or Tm. Since the high strength of the Mg-based alloy is likely due to the unique LPSO structure, we are also working on elucidating the formation mechanism of the LPSO structure in other alloy systems. In particular, “Materials Science of Mille-feuille Structure” research project (Grants-in-aid for Scientific Research / New Academic Field Research) started in the academic year 2018, we are working on elucidating the origin of mechanical properties and developing high-strength materials not only in Mg alloys but also in various material systems with layered structures. Since the high strength of the Mg-based alloy is likely due to the unique LPSO structure, we are also working on elucidating the formation mechanism of the LPSO structure in other alloy systems. In particular, “Materials Science of Millefeuille Structure” research project (Grants-in-aid for Scientific Research / New Academic Field Research) started in the academic year 2018, we are working on elucidating the origin of mechanical properties and developing high-strength materials not only in Mg alloys, but also in various material systems with layered structures. Magnesium alloy development at Kumamoto University began in 2001 with the development of a magnesium alloy having an LPSO structure using a method known as quenching [see Fig. 3 (a)]. Then in 2003, we succeeded in developing magnesium alloy with LPSO structure even by using the more common casting method. With the quenching method, a thin quenched material is made by injecting melted alloy into a copper cylinder rotating at high speed in order to solidify the material. It is subsequently compressed to make a preform, and it is formed by extrusion. Magnesium alloy made by the quenching method has excellent material properties, but it is expensive to produce. 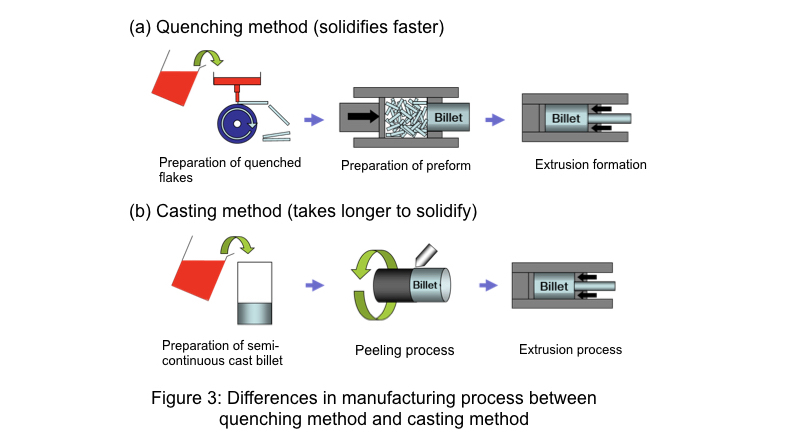 On the other hand, with the casting method, the molten alloy is solidified by a semi-continuous casting method in order to form a mass called a billet or a slab, after which extrusion processing or rolling processing is performed [see Fig. 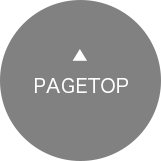 3(b)]. 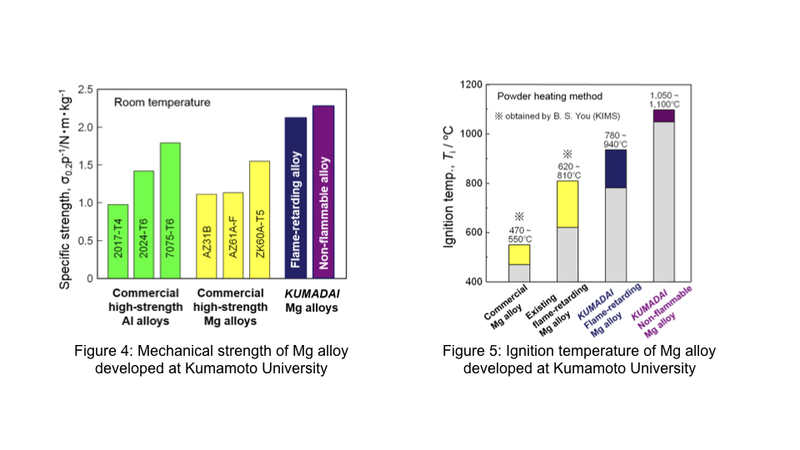 By making the magnesium alloy using the casting method, the material strength at room temperature is higher than that of conventional Mg alloy (see Figure 4). It has also been possible with this method to raise the ignition temperature beyond that of conventional magnesium alloy (non-flammable magnesium alloy: Mg-Al-Ca system, see Figure 5). In addition, the LPSO-type magnesium alloy made by the quenching method can improve corrosion resistance (rust resistance), and overcomes the drawbacks of conventional magnesium alloys. Figure 6 (a) is a TEM micrograph of the Mg-Zn-Y alloy prepared by the casting method. In this cast alloy, the phase with LPSO structure (part that appears white) and the phase of α-Mg with hcp structure (part that appears black) are mixed. In such a state immediately after casting, the yield strength is an ordinary value of 100 MPa, but when subjected to extrusion processing the structure changes as shown in Figure 6 (b), and the yield strength becomes stronger linearly. In this state, we have found that the yield strength is more than 4 times greater (400 MPa or more) at a processing rate with equivalent strain of about 2 (see Figure 6 (c)). These results show that the Mg alloy with the LPSO structure does not display high strength as a single crystal in an intrinsic manner. However its properties are significantly increased by the deformation process. Therefore, it is compelling in alloy design and development not only to design alloy composition for having LPSO structure formation, but more importantly, to develop the proper processing parameters to obtain the maximum properties and performance.